Let one of our winemakers be your guide, as you enjoy a private tasting experience at our new winery located at our Sconni Block Estate Vineyard. Enjoy expansive views of our vineyards and the Blue Mountains during a seated tasting including a selection of some of our most coveted small lot wines, barrel samples and special Cult of Ceres offerings. There’s no better way to experience wine country in Walla Walla than as a guest at our table! Ceres, the ancient goddess of agriculture, graces our Dusted Valley labels and embodies our family’s deep farming roots and our region’s rich agricultural history. In Roman mythology, a special offering of the first fruits of the wine harvest was made to Liber, Ceres’ companion. This offering was called the Sacrima and serves as the inspiration for our private tasting experience. Price: $50 per person +tax | $40 per person +tax for COC & STS Club Members. Tasting fees are refundable with $100/person minimum wine purchase or wine club sign up. Duration: While we aim to keep the tour and tasting to 90 minutes, we suggest allowing for a total of 2 hours to ensure you have plenty of time to reach your next destination. Group Size: Minimum number of guests – 4 | Maximum number of guests – 14. For groups of four or less, please contact Cindy for additional semi-private tasting options. Reservations: This tasting experience is offered April through August by advanced appointment only. 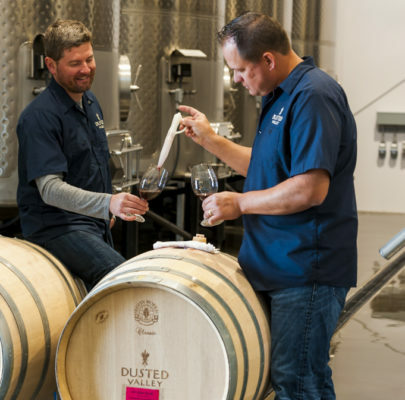 To request an appointment, please contact Cindy Braunel, Dusted Valley Co-Owner, at 509-525-1337 or info@dustedvalley.com and a member of our hospitality team will follow up to schedule your tasting. Please note that your reservation is not set until you receive a confirmation email. Cancellations: Tasting fees will be charged at the time of booking. Due to the highly personal nature of these tastings and extra staff required to provide an exceptional experience, we kindly request 48-hours notice if your plans change or you need to cancel or reschedule. After 48-hours, tasting fees are non-refundable.